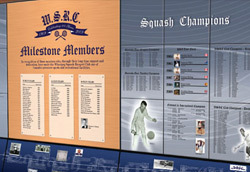 Walls of Fame and Memorial Displays designed by Planned Legacy allow you to highlight champions, chronicle milestones and recognize victory in an innovative, easy-to-update fashion. Through a combination of bold design and cutting edge materials, Planned Legacy will create a display that captures the stature and achievements of your leaders and champions, and projects them with dignity and distinction. Planned Legacy memorial displays offer a dynamic and distinguished way to celebrate lives lived and to mark individual milestones. Whether it's a self-standing kiosk with an engaging multimedia presentation, or a striking architectural wall with a timeline and photomural, you can be sure your Planned Legacy Memorial will be an enduring testament that allows individuals to live on and on. For more information, client references or online demonstrations please call us Toll Free at 1.866.882.3580 or e-mail us at solutions@plannedlegacy.com. Also be sure to check out the Wall of Fame examples in our Recognition Display Photo Gallery for more ideas and inspiration!